Celebrating SIU’s Saluki TRADITION, Saluki PRIDE and Saluki PROMISE for SIU’s 150th Anniversary, This Is SIU is publishing a monthly feature detailing the past, present and future of notable places, events and people on campus. The eagle, with its realism and formidable presence, makes clear how valuable these specimens can be to the learning process. Books are wonderful. Nature is essential. But there’s nothing like being able to walk right up to the bird itself for a closer look. 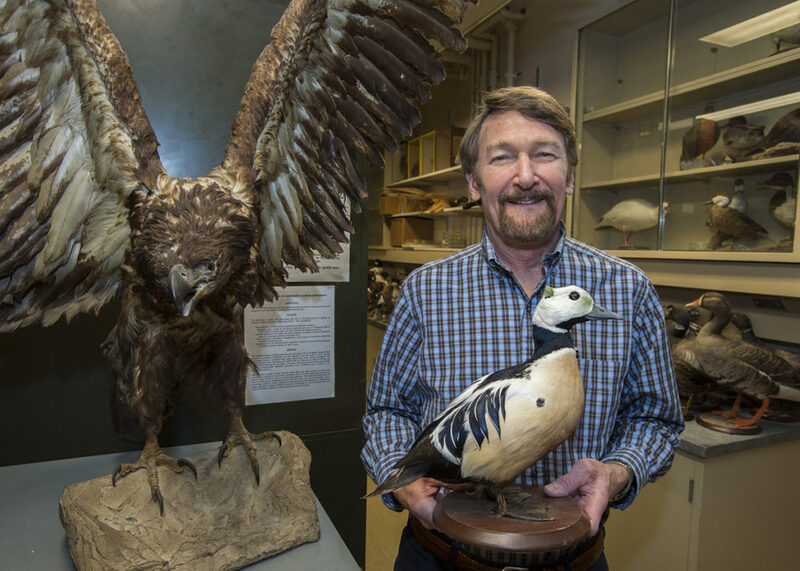 “One of the most amazing things about birds are feathers,” said James Lovvorn, professor in the zoology degree program, who looks after the collection. “Dinosaurs had feathers, and birds evolved from dinosaurs. And it’s amazing how very warm feathers are for their weight, and their structure is very diverse. The wing feathers are especially interesting, with how they spread and then are still able to slide perfectly over each other and fold, altering yet maintaining their shape. “Engineers study them, but for students to actually see this close up, it’s really important,” he said. For major research universities such as SIU, which is celebrating its 150th anniversary, such collections are a must. The collections reflect a past tradition of tremendous scholarship and pride that positively impacts today’s students, as well. Keeping that pride along for the future has its challenges, but SIU is poised, as always, for such commitments. SIU has a rich tradition in such collections, the first of which came along in the earliest days of the university under the guidance of George Hazen French. At one point the collections included more than 770,000 specimens of some 10,000 known animal species from Illinois and all over the world. The collections were among the largest and oldest in the state, in some cases dating back to the 1880s or earlier, providing teachers, scientists and researchers a major source of data. 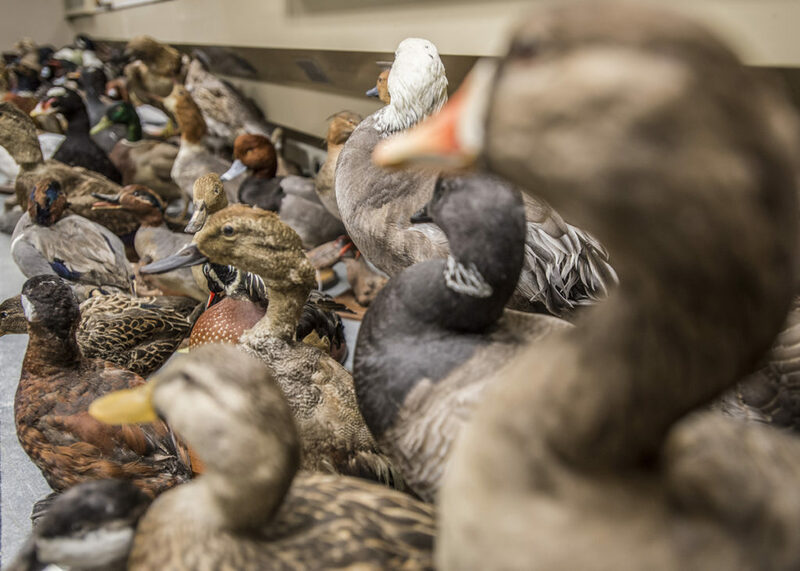 The avian collection, housed on the fourth floor of the Life Science II building on campus, started in 1878 and includes an especially good representation of birds from North America, as well as many from the Pacific Islands, South America, Africa, Eurasia and Australia. It currently features almost 3,000 specimens of 730 bird species, including great blue herons, owls, ducks, dove, osprey, eagles, hawks and songbirds galore. Along with the birds, it includes about 200 egg sets, numerous complete skeletons and many nests. About 3,000 mammal specimens “live” at SIU, too, along with an insect collection of 200,000 specimens. There is also an arachnid collection of about 125,000 specimens that currently is in storage. Together, the collections provide a vital reference for students and researchers alike, and a legacy pointing the way to the future. For Lovvorn, however, it’s all about the ducks. He has spent years studying certain types, especially those such as the Steller’s eider, a large, subtly colored marine bird that lives at least some of its life in Alaska, and he keeps a flock of long-tailed ducks at a research facility on campus as part of longer-term research project on their foraging habits. “Long-tailed ducks are just really social and a lot of fun,” said Lovvorn, examining a mounted specimen of the duck in his lab. 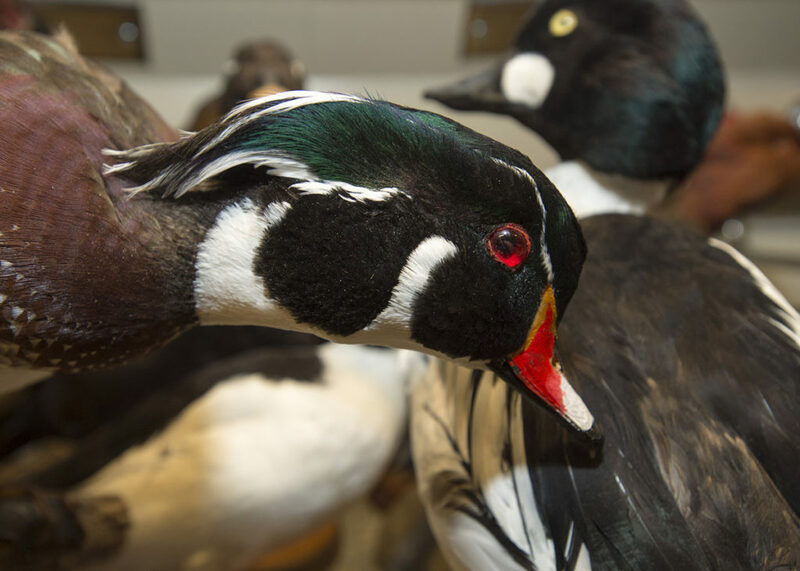 Another SIU researcher who works a lot with water fowl, Mike Eichholz, also keeps a collection of the specimens, Lovvorn said. 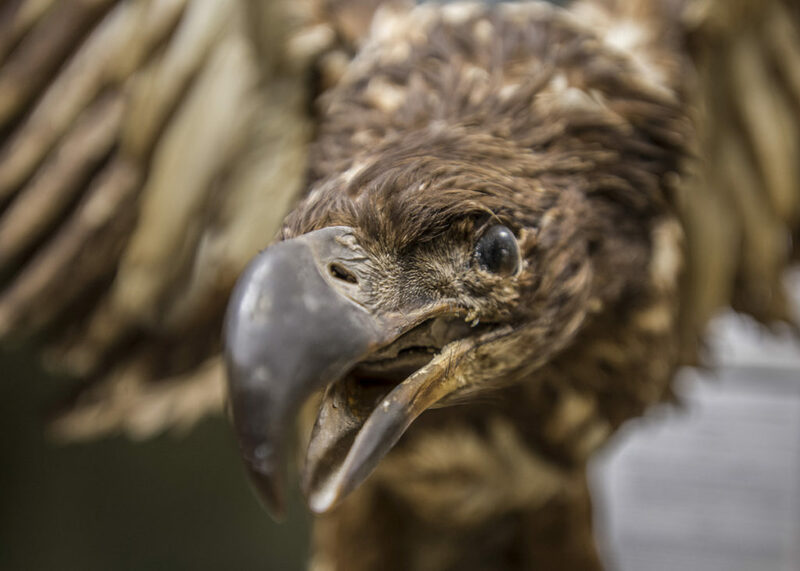 Many of the specimens are taxidermy items, mounted in life-like poses but lacking certain information – such as the area and date where it was collected – that might make them more “scientific.” A few years ago, Lovvorn recalled, he received a call from a retired state wildlife employee from Missouri who was also a taxidermist. The man had dozens and dozens of examples in his basement and he wanted them to have a good home. “So I went down with some students and picked them up and brought them back,” Lovvorn said, smiling at the memory of adding those 122 specimens to the already impressive collection. Many other specimens, however, have all the pertinent information accompanying their Earthly remains. “The collection has rather diverse origins,” Lovvorn said. During a recent visit, a high number of mounted examples were sitting on a counter top in the room where they are kept. Lovvorn explained that his traditional spring semester ornithology class had just taken a lab practical exam that required them to identify certain species using the mounted specimens. Advances in genetic science also may increase the collection’s value as time moves on, Lovvorn said.